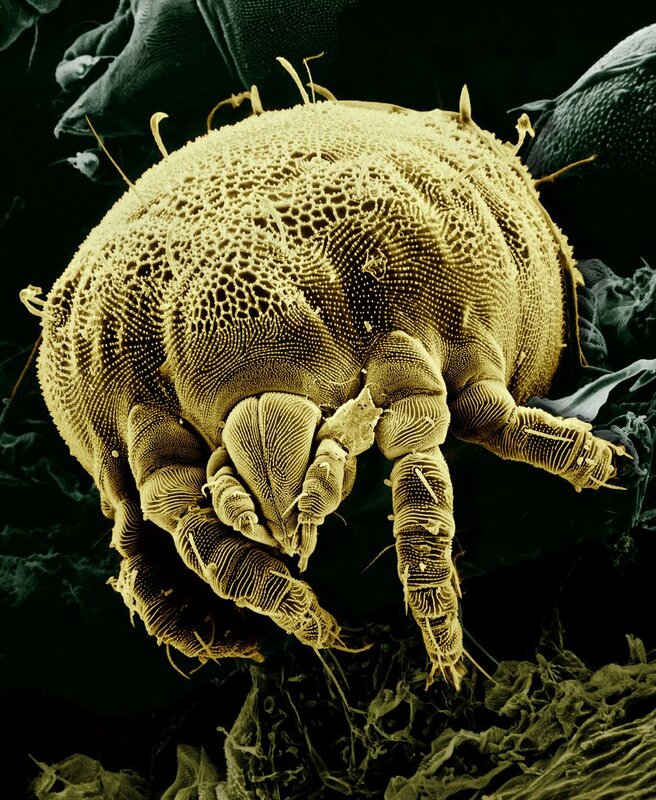 Español: Ácaro microscópico Historically, mites have been difficult to study because of their minute size. But now, ARS scientists are freezing mites in their tracks and using scanning electron microscopy to observe them in detail. Here a yellow mite, Lorryia formosa, commonly found on citrus plants, is shown among some fungi. False color. Magnified about 850x. Photo by Eric Erbe; digital colorization by Chris Pooley. "Thank you for your interest in our images. All of the micrographs on the web site are in the public domain and can be freely used. Proper accreditation would be "Erbe, Pooley: USDA, ARS, EMU". High Resolution copies of the web images are available on our FTP site ftp://198.77.171.17/pub/"
This page was last modified on 15 April 2007, at 22:22.